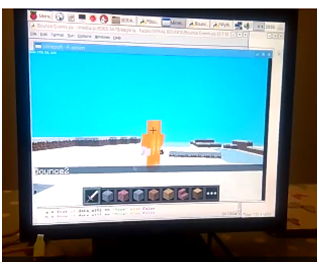 Which created random bouncing Minecraft character triggered by a Micro:bit. This extends this by using two Micro:bits one remains connected to the Pi and listens for messages from the second Micro:bit which runs off batteries. If you press "a" on the battery run Micro:bit then it sends a message via the radio module. The Pi connected Micro:bit then receives the message and then sends the message to the Python script through the serial connection. In a nutshell its a radio controlled bouncing character.